Tai Croissant review: Which is our favourite flavour? There’s something comforting about Japanese taiyaki. The fish-shaped snack usually comes with piping hot fillings such as azuki beans and is a street food enjoyed by many. If you love taiyaki but fancy it with a more flaky texture and buttery taste, consider your dream come true! Someone has actually thought of marrying taiyaki with croissant to give us a pastry that’s fragrant, buttery and flaky, filled with satisfying sweet or savoury fillings. We’re talking about Tai Croissant, which was initially opened in Taiwan before making its way to Singapore last July. 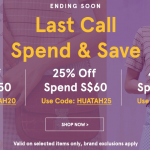 They started with their first outlet at Tampines 1 and subsequently opened up new outlets in Causeway Point and The Centrepoint, a testimony to their popularity. 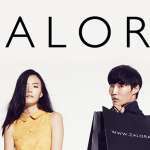 We visited their outlet at The Centrepoint to try out the snacks for ourselves to understand why it’s so popular among office workers and students alike. Tai Croissant review: Which are our favourite flavours? 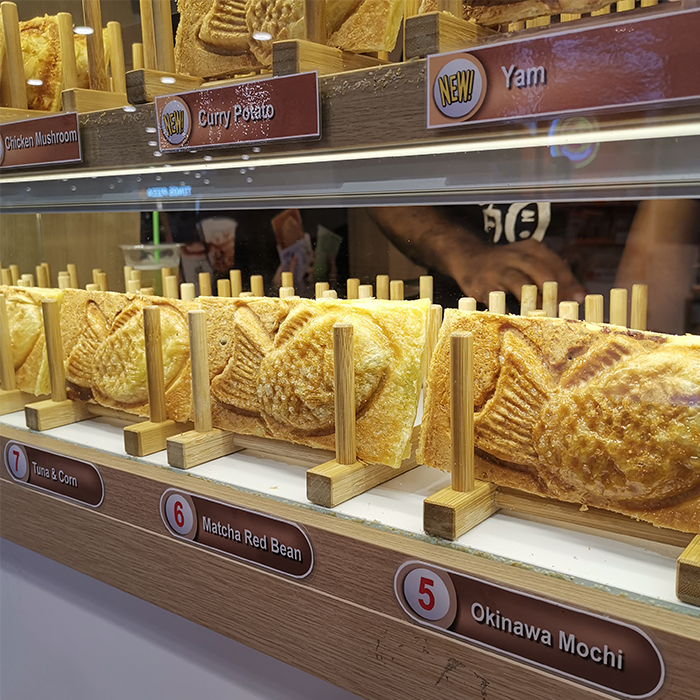 Each taiyaki croissant is made at the point of ordering. 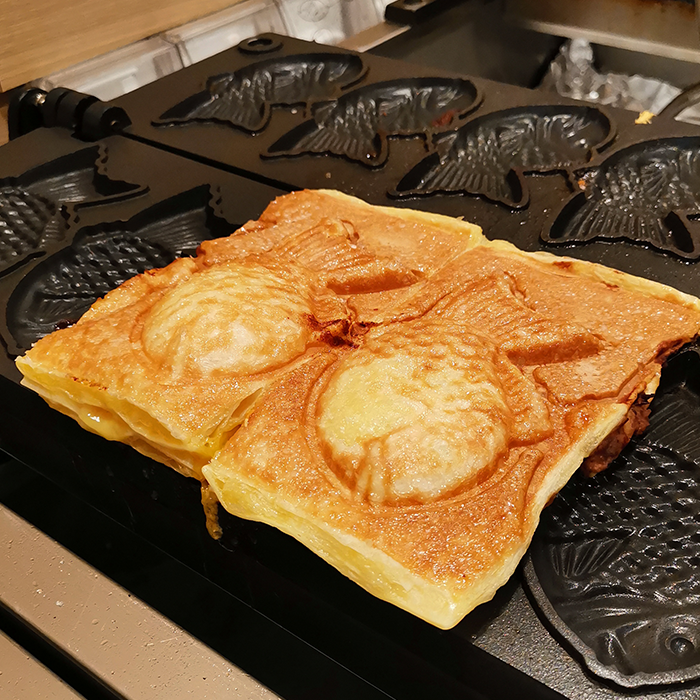 We were told that these taiyaki croissants are made only at the point of ordering, which is why they have a nice crisp when you bite into them. The warmth from the freshly made taiyaki croissants also bring out the flavours better. While you’d have to wait for a few minutes for your snack to be made, we think it’s worth the time – the difference between the flavours of one that’s made-on-the-spot and pre-made is clear. Each of these taiyaki croissants also has a sugar coating to give it an additional crisp on the outside, while maintaining the tenderness and softness inside. Cheesy Smoked Chicken was the staff’s recommendation and we loved it too! We heard that Hokkaido Custard is the customer’s favourite. But the staff’s favourite? It was unanimous: Cheesy Smoked Chicken. 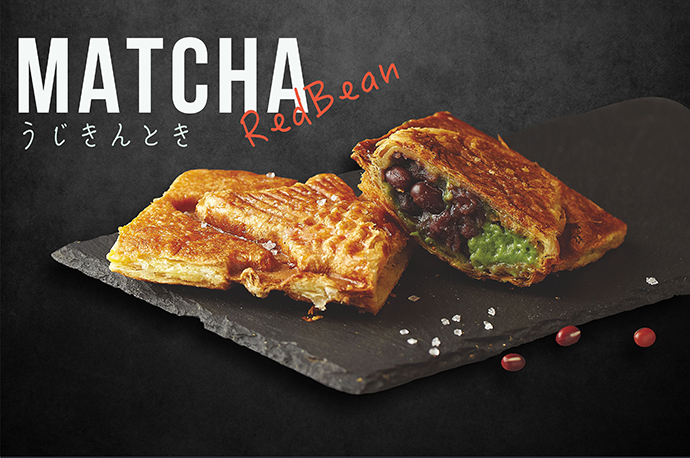 Matcha Red Bean taiyaki croissant. Avenue One tried the Hokkaido Custard, Matcha Red Bean, Ham & Cheese, and Cheesy Smoked Chicken and found that we gravitated towards the savoury flavours. Just like the few staff members we spoke to, our favourite among these was also the Cheesy Smoked Chicken. 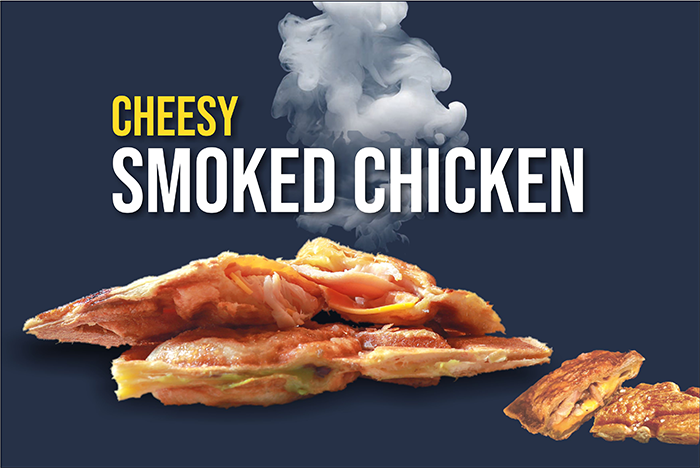 While you won’t be expecting to get stretchy cheese that goes on for miles, the Cheesy Smoked Chicken features perfectly melted cheese that complemented the smoky taste of the meat. We can imagine it as a very satisfying snack to munch on, especially when you need to fight off hunger pangs at 4pm in the office. Each Tai Croissant comes with 80 layers of crispy crust, which we think is what gives the pastry such a gratifying texture. The pastry is what makes even the “plain” option (Sugared Almond) an enjoyable treat. 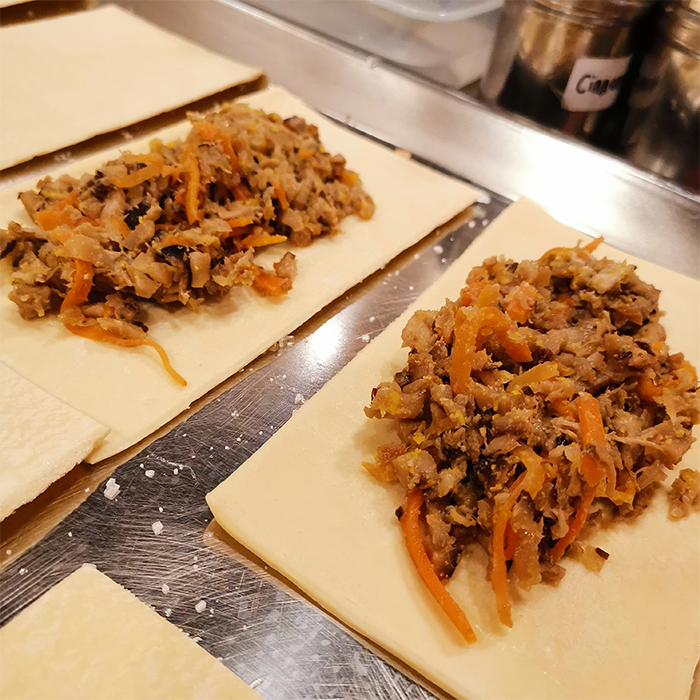 They also don’t stint on quality – just look at the generous amount of fillings that is put into each taiyaki croissant! Tai Croissant is very generous with the fillings they put into each taiyaki croissant. Besides the four flavours we mentioned, you can also look forward to many other options. Okinawa Mochi, for instance, features real mochi that gives it a chewy bite. Oreo Custard, we heard, is popular among children with a sweet tooth. You can also consider the Tuna & Corn and Cheesy Potato, if you like savoury snacks, and Apple Cinnamon and Kaya Peanut Strawberry if you prefer something sweet. Your can order a bubble tea to go with your snack. 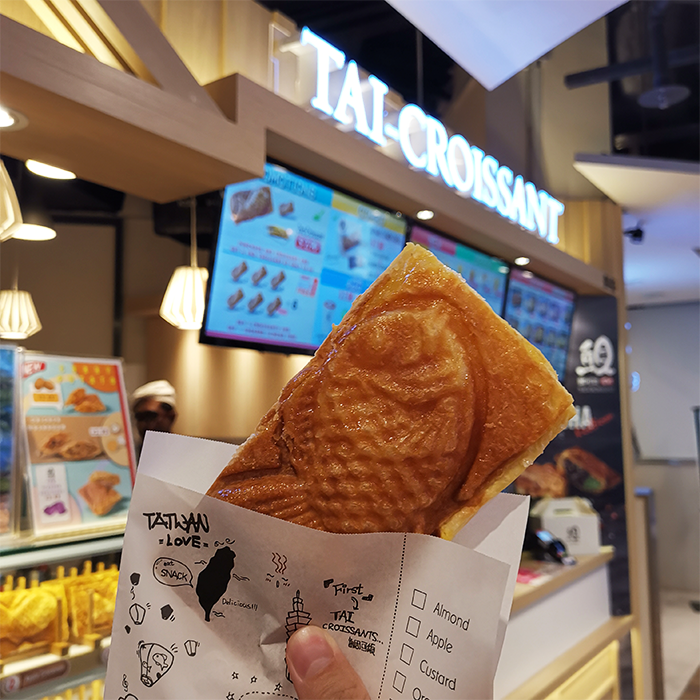 On top of these delectable snacks, Tai Croissant also sells bubble tea – something that you may not notice when you see the kiosk. 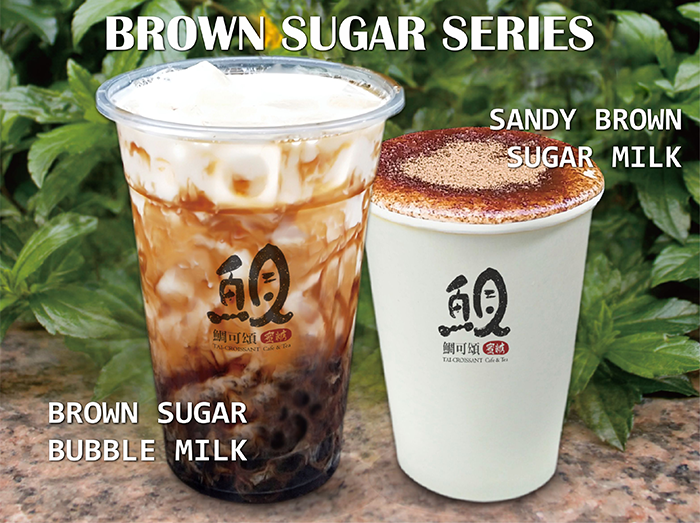 They even have the tea-of-the-moment: brown sugar bubble tea, retailing at just S$2 if you buy it with the taiyaki croissants! Bulk promotions are also available if you purchase at least five croissants, which can be put into a nice box to go – we think it’s a great option as a treat for your colleagues or clients. Tai Croissant is located at B1-K4 Tampines 1, B1-K27 Causeway Point, and B1-K3 The Centrepoint.